The GRUGACARREE, located of the former Festwiese/Gruga is today an attractive area with an urban quality of life which is characterized by a utilization mix of living, working and recreation. The area is approximately 12.4 hectares in size and is located in the pulsating district Rüttenscheid. It is in close proximity to the Exhibition Center and the Grugapark and also enjoys very good traffic connections. Another point in its favour is the access to the A52 motorway which is in the immediate vicinity and the international airport in Düsseldorf can be reached by car in 20 minutes. The GRUGACAREE is also easy to reach by public transport. The underground takes only six minutes to reach Essen’s inner city. This location makes an impact with energy efficient, modern offices and housing. In 2015, the last vacant site in the GRUGACARREE was allotted to Brenntag, the world market leader for chemical distribution. The district development and marketing was the responsibility of EWG - Essener Wirtschaftsförderung. Not only this building, but also that of the energy service provider ista will be completed in 2017. 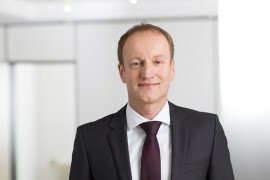 As a result, the plan pursued by the Essener Wirtschaftsförderung to develop an attractive office and housing location in the district of Rüttenscheid has been a complete success. The headquarters of both Brenntag and ista are included in the total of ten office projects with an area of 130,000 m² gross building area which will have been developed in the GRUGACARREE, offering a total of approximately 5,300 work places. In addition, this location is dominated by three housing projects with 214 high quality units of which 103 are owner-occupied flats with a total living area of approximately 17,000 m². The private investment volume amounts to approximately 430 million Euros plus an additional investment of approximately five million Euros for public infrastructure. The international energy service provider ista will move to its new location in the new office building "Silberkuhlsturm" at the end of 2017. The Essen-based company, KÖLBL KRUSE, is currently erecting the new office building on the 5,343 m² site on the corner of Messeallee/Ecke Luxemburger Straße, thus, providing nearly 12,000 m² gross building area. The new building will have six floors and is being erected according to the plans of the Hamburg-based architects BN ARCHITEKTEN borchardt.nentwig. Brenntag, the world market leader for chemical distribution will move its company headquarters from Mülheim an der Ruhr to Essen. HOCHTIEF Projektentwicklung GmbH is erecting a six-floor building complex on the 9,250 m² site with approximately 20,700 m² gross building area, in accordance with the plans of the Cologne-based architects JSWD Architekten GmbH & Co. KG. The office building will have an integrated staff restaurant and conference area and has been designed to house approximately 650 employees. It is to be erected in accordance with LEED-Gold sustainability criteria and the move is expected to take place at the end of 2017. The office building which was completed in 2012 and which is located at Luxemburger Straße 3 is used in its entirety by the Atos Headquarters for Germany and CEMA. The international IT service provider has relocated its staff from various other locations to here. The headquarters was designed by HOCHTIEF Projektentwicklung, has 7.500 m² rental area and provides approximately 600 work places, a staff restaurant and 360 parking spaces. It was built in accordance with the criteria of the "DGNB - Deutschen Gesellschaft für Nachhaltiges Bauen" (The German Society for Sustainable Construction) and also awarded the corresponding certificate in silver. At the end of 2009, the building project "Rüttenscheider Tor" was erected on the corner segment Messeallee/Alfredstraße. The L-shaped, six-storey property is situated along the Alfredstraße and Messeallee and has approximately 9,000 m² office rental area and 170 parking spaces in an underground carpark. The office building received the silver certificate from the "DGNB - Deutschen Gesellschaft für Nachhaltiges Bauen" (The German Society for Sustainable Construction) and is currently rented by renowned tenants. The E.ON-Konzern administration building was completed in 2009 on the former site Grugastadion which had been located on the Norbertsrasse. A particular characteristic of the building complex are the 63 meter high, 15-storey elliptical towers. The rental area is in excess of 40,000 m² and provides space for approximately 2,000 employees. This attractive building complex has set standards by the utilisation of various technological innovations regarding energy efficiency and climate protection. In 2002, "Büropark an der Gruga" located on the Alfredstraße, marked the beginning of the development of the GRUGACARREE. Formerly used by the HOCHTIEF-Gesellschaften, the five-storey property has 27,000 m² rental space and a restaurant. Areas of varying sizes can be rented. The building has a "comb" structure and was designed by the Cologne-based Architekturbüros Kaspar Kraemer. The housing project Living One in Essen Rüttenscheid has been developed by Kölbl Kruse Living GmbH and built on the remaining site between Messeallee and Moritzstraße providing a total of 84 high-quality, owner-occupied flats located in two attractive, identical building sections. These have integrated underground parking facilities with 150 spaces, as well as, bicycle cellars and a charging station for E-bikes. The architecture of the building structures is dominated by a glass façade facing south. The park, in the center of residential complex, has not only extensive green areas, but also individually designed entrance areas. The developers have built a children’s playground located towards the Norbertstraße which, up to now, had been missing within in the GRUGACARREE. In 2009, Lynen Immobilien built the "Stadtvilla" comprising 19 high-quality, owner-occupied flats in the vicinity of the Moritzstrasse which, in turn, is located in the direct neighbourhood of "Rüttenscheider Tor". Modern, contemporary architecture and innovative, cost saving energy technology in the form of an air/water heat pump and a high-performance solar energy system characterises the apartment building with its classical-style features. In 2006, the THS-Treuhandstelle GmbH (now: Vivawest Wohnen GmbH) realised the first housing complex comprising 111 rental flats in the GRUGACARREE which is located between Messeallee and Moritzstraße. Clear, spacious layout plans, an extraordinary cubic shape, the house-in-house flair with open galleries, as well as, maisonettes and single-occupancy apartments characterise the property. The inner area was designed to reflect the exemplary "secret garden of Paris" and provides a very pleasant place to spend time in.